The Scholastic Art & Writing Awards, the nation’s longest-running and most prestigious scholarship and recognition program for creative teens, are now accepting submissions from students in grades 7–12 from across the country. Presented by the nonprofit Alliance for Young Artists & Writers, the Awards have fostered the talent of millions of students since 1923 and feature a distinguished list of alumni including Andy Warhol, Richard Avedon, Sylvia Plath, Kay WalkingStick, John Baldessari, Zac Posen, and Lena Dunham, all of whom received recognition in the Awards when they were teens. In the 2018 program year, a record-breaking 346,000 works were submitted for adjudication at the regional level, with more than 2,800 students receiving national recognition, including more than $200,000 in direct scholarships and millions in tuition support. Students age 13 and above residing in the United States, U.S. territories, or Canada, or enrolled in an accredited American school in the rest of the world, are invited to submit original work in any of the Awards’ 29 art and writing categories, including architecture, painting, flash fiction, poetry, printmaking, and video game design. All works are blindly adjudicated based on originality, technical skill, and the emergence of personal vision or voice, first on a regional level by more than 100 local affiliates of the Alliance, and then nationally by an impressive panel of industry experts. Annually, the Alliance partners with individuals, foundations, and corporations to offer scholarship opportunities for students in certain categories or addressing particular themes. American Voices & Visions Medal: The highest regional honor awarded to one artist and one writer from each region. Best-in-Grade Award: Underwritten by Bloomberg Philanthropies, this award provides 24 students (two artists and two writers per grade 7–12) with $500 scholarships. Civic Expression Award: Underwritten by the Maurice R. Robinson Fund, this award provides $1,000 scholarships to six students whose art or writing promotes responsible civic life. New York Life Award: Underwritten by the New York Life Foundation, this award recognizes six young students with $1,000 scholarships for their work exploring personal grief, loss, and bereavement. One Earth Award: This award provides four students with $1,000 scholarships for creative works that encourage the awareness of, and meaningful responses to, pressing issues of human-caused climate change. Special awards are also available for students and educators from Virginia, North Carolina, South Carolina, and Georgia. Portfolio Awards: The program’s highest national honor awarding 16 high school seniors each with a $10,000 scholarship for his or her writing or art portfolio; 30 Silver Medal with Distinction Portfolio recipients each receive $1,000 scholarships. The Alliance/ACT-SO Journey Award: In partnership with NAACP Afro-Academic, Cultural, Technological and Scientific Olympics (ACT-SO), this award provides travel stipends for up to ten ACT-SO scholars, who receive National Medals, to attend the National Ceremony at Carnegie Hall. The ESA Foundation Award for Video Game Design: Underwritten by the Entertainment Software Association Foundation, this award provides two students who exhibit excellence in video game design with $1,000 scholarships. The Herblock Award for Editorial Cartoon: Underwritten by The Herb Block Foundation, this award provides three young artists with $1,000 scholarships for their outstanding editorial cartoons. 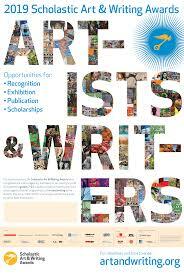 For more information about the Alliance for Young Artists & Writers or the Scholastic Art & Writing Awards, visit the online press kit: http://mediaroom.scholastic.com/artandwriting. Founded in 1923, the Scholastic Art & Writing Awards are presented by the national nonprofit organization the Alliance for Young Artists & Writers and are made possible through the generosity of Scholastic Inc., The Maurice R. Robinson Fund, Command Web Offset Co., The New York Times, New York Life Foundation, The Herb Block Foundation, Blick Art Materials & Utrecht Art Supplies, Golden Artist Colors, Bloomberg Philanthropies, ESA Foundation, National Endowment for the Arts, Creative Circle, New York City Department of Cultural Affairs, Amazon Literary Partnerships, and numerous other individual, foundation, and corporate funders. The National Student Poets Program is made possible by funds from the Institute of Museum and Library Services.